The AIADMK announced a merger on Monday between two of its camps after months of sparring following the death of Jayalalithaa. Warring factions of Tamil Nadu's ruling AIADMK announced a merger on Monday. Chennai: After months of hard negotiations and several false starts, as two rival factions of Tamil Nadu's ruling AIADMK announced a merger, dissent rose from 18 party lawmakers who are opposed to the decision to expel VK Sasikala. The lawmakers say they will meet the Governor tomorrow to decide on their next course of action - a comment that is seen as a potential threat to the government of Chief Minister E Palaniswami, which has 134 members in the 234-member assembly. The expulsion of Ms Sasikala was a pre-condition of the faction led by O Panneerselvam for joining the larger group led by Mr Palaniswami. Late in the evening, raising pro-Sasikala slogans, the 18 lawmakers reached the Jayalalithaa memorial in Chennai, where hours before the two factions had shaken hands. "The Tamil Nadu Governor has given us appointment at 10 am tomorrow. 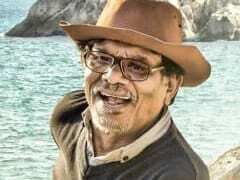 We'll discuss the issue with him," said P Vetrivel, one of the supporters of Ms Sasikala and her nephew TTV Dhinakaran, the party number 2 who had been sidelined to facilitate the merger. Around 20 lawmakers met Mr Dhinakaran earlier today. The leader, who has been trying to rally his supporters for a comeback, had met VK Sasikala, who is also his aunt, in jail last week. The AIADMK has 134 members in the 234-member house. The midway mark is 117. The party had split months after the death of Jayalalithaa. The film star-turned-politician headed both the party and the state government until her death in December. Ms Sasikala, her longtime live-in aide, had taken charge of the party soon after. The two factions had been working on the merger for months. 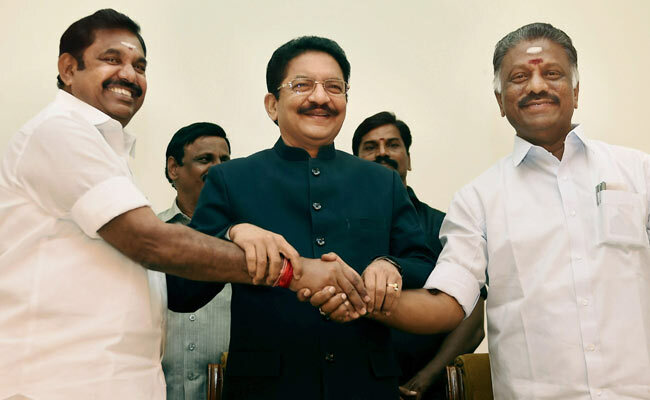 Under the formula they finally agreed on, OPS, who stood in as Chief Minister thrice for Jayalalithaa during her lifetime, has settled for the role of deputy to EPS -- the man who once worked under him and who was chosen by Ms Sasikala to replace him as Chief Minister. "The burden in my heart is gone. No one can separate us, we are children of Amma (Jayalalithaa), and we are brothers," said Mr Panneerselvam, who will also be party coordinator, helped by a "coordination committee". Three of the 10 lawmakers in his camp will be ministers. The merged team has decided to ask the Election Commission for its "two leaves symbol", taken away because of the competing claims by the two factions. After taking control of the party, Ms Sasikala had angled for the Chief Minister's post, forcing the resignation of OPS, who then rebelled. Her plans crashed when she was sentenced to a four-year jail term for corruption. Before going to jail, she named EPS as the new Chief Minister and her nephew, TTV Dhinakaran, the AIADMK's number No 2. Mr Palaniswami and Mr Panneerselvam's separate meetings with Prime Minister Narendra Modi in Delhi recently were seen to be the propellant for a merger. The BJP is believed to be heavily invested in a reunited AIADMK as it tries to gain political space in Tamil Nadu, which has always oscillated between the regional rivals AIADMK and DMK.